Raytheon has opened its travelling interactive STEM exhibition, MathsAlive! in Canberra to help encourage the next generation of STEM specialists to engage with engineering at an early age. Debuting on Friday with two new displays, MathsAlive! is a global initiative focused on science, technology, engineering and maths (STEM). Assistant Minister for Defence David Fawcett was on hand to officially launch MathsAlive! 2018 and stressed the importance of programs like MathsAlive! in developing the next-generation of Australian engineers and STEM specialists. "I welcome the ongoing commitment by Raytheon to engage young Australians by helping them visualise what a career in science or engineering might look like," he said. From the US to the Middle East, MathsAlive! has already inspired hundreds of thousands of students across five countries, encouraging young people to pursue a career in STEM by connecting to them through the things that they love, like music, sports, movies and games. 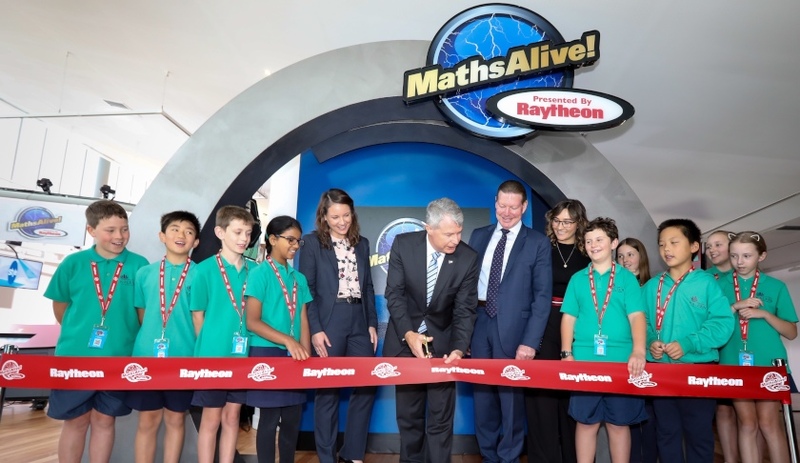 For Jessica Formica, Engineering Staff Executive at Raytheon Australia, the MathsAlive! program serves a valuable key for connecting the next-generation of Australian STEM specialists with the real world applications. "Maths and Science isn't scary, it is something that is fun and that is at the core of MathsAlive. Keeping STEM in textbooks isn't doing it justice, bringing it into the world, through games and sport is an interesting way of getting kids to develop an interest and a passion in the field for them to take it on later in life," Formica explained. For almost two decades, Raytheon has invested in initiatives that support the development of Australia’s STEM programs, including an 11-year partnership with the National Science and Technology Centre, Questacon. Raytheon Australia managing director Michael Ward said, "Raytheon Australia is inspiring the next generation of Australian engineers by supporting students through every step in their journey toward a STEM career – from primary school interaction and secondary school scholarships to university engagement all the way through to employment." From introducing an innovative digital broadcast studio in Canberra to implementing a primary school space-based program with NASA astronauts, Raytheon Australia and Questacon have partnered to create world-leading experiences that drive a passion in Australian students to pursue meaningful STEM careers. "Raytheon Australia has a critical role to ensure there is a healthy pipeline of skilled future leaders who will one day join the 25,000 Australians who make up the workforce behind the Defence Force. With more than 1,400 employees across the country, it is our duty to ensure that we cultivate this sovereign defence industry well into the future," Ward said. Senator Fawcett said, "The Coalition government’s $200 billion investment in new defence capability and the commitment to create a sustainable sovereign defence industry will require more young Australians to choose subjects and learning pathways that build on STEM and prepare them for careers in this high-tech national endeavour." Most recently, this partnership saw the successful pilot launch of the Australian Engineering is Elementary program, which provided teachers with a framework to deliver content aligned with the Australian curriculum using hands-on problem solving through engineering solutions.